I'm not a fan of reality shows at all...except Project Runway, whose new season begins tonight. It takes me back to art school days...well art school on speed. I don't think I ever had to complete major projects under such time constraints. What I love about the show is the variety of challenges to be completed. 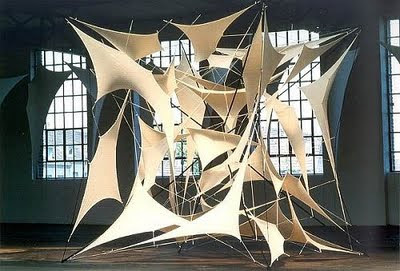 They stretch the mind and sometimes the talents and abilities of the designers. 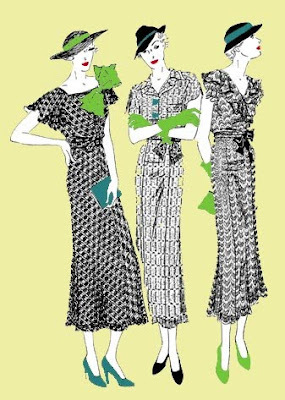 My favorites have been the outfit from grocery store items and the re-design of the postal workers uniforms. I root for the 'I taught myself to sew' crowd for awhile but then they inevitably hit a wall where self education and resourcefulness can't make up for training. Then I root for a combination of most talented and likable. I'm not a fan of the folks with claws and fangs. As an artist I think Project Runway fires up that spark in me to look at things differently and see all sorts of ways to accomplish a task. Of course the ever present mantra...make it work cheers me on! I should probably have that sign posted in the studio. Upon arriving back in my hometown after over thirty years I have discovered that people I knew long ago have been doing some interesting things. Kris Winter, a former classmate, is the founder and energy behind Paper Cow Theater. Camps, storytelling, and participatory theater are offerings you can find in this beautifully renovated barn (Kris's brother helped renovate the barn and I know his work is great because he built a home for my parents). Check out her site and if your feeling theatrical sign up for a class, which are not just for children! If you are a fan of all things textile, like I am, Textile Source Blog is a spot you really need to check out. It is primarily a blog for the design industry but is filled with amazing images of fabrics used in lighting, art, furniture and clothing with links to more information about each post. I was blown away by the images (I tend to get more engrossed in imagery than words). 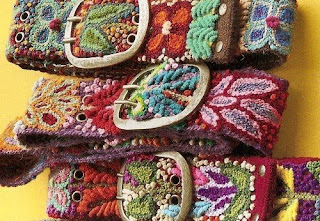 The top image are belts that are handstitched by women Ayacucho, Brazil, available from Sundance. The lower image is sculpture by Jens J. Meyer called Kubus. I went to Madison, WI last weekend and had a great time with my friend Susan. 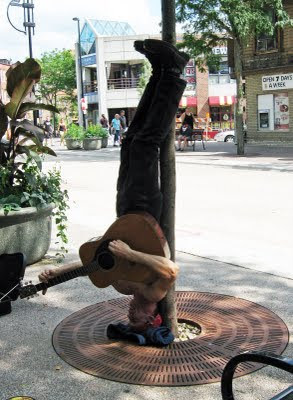 We were walking down State Street and I heard a guitar player, when I saw the guy....he was standing upside down. What a way to get a new perspective on art...love...life. Just play your guitar upside down and see what happens.